For this issue, we reached out to schools in Beijing to ask who was making an impact on their school communities. Our terms were loose, as we were curious about individuals who made a difference in leadership, community, and charity. We don’t feel like someone necessarily has to contribute to charity to be a community star, as sometimes a great, reliable friend in a school community can make just as much of an impact. Each of these stories is special, and we’re so proud to have had the chance to talk with these students and teachers. Through these experiences, her view of charity has become mature, and she is not a supporter of the type of charity that’s meant for one time as an “obligation.” She sees this mindset negatively impacting children at Blue Sky Orphanage. “It’s important not to spoil them. I see volunteers coming in and giving them toys and being overly sympathetic toward them, but then never come again. They can become dependent on that giving and used to it. Volunteering with them is like maintaining a friendship. They’re not extendible.” Sankar became quite proud of the children because over time of seeing these relationships that had no depth, the children stopped warming up to first time visitors so quickly. 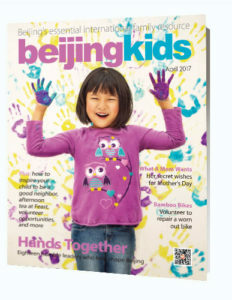 This is an updated version of the article that originally appeared on p. 36 of beijingkids April Issue.